After learning nothing of interest from the Arkham Asylum menagerie, Batman's investigation into the recent attacks on the close allies of both Batman and Bruce Wayne leads to Paris and a reunion with Ducard who has already figured out the truth of attacks which the Dark Knight Detective won't piece together until the issue's conclusion: someone is systematically targeting everyone who had a hand in creating Batman. While the mystery continues to deepen, and we also see nods to various aspects of Batman's past (such visiting his old sensei in the Himalayas where a certain flower grows), there are still aspects of the arc I'm not fond of starting with the bizarre Clayface-ish nightmare creature that attacks Batman and Ducard. While there's obviously someone quite intelligent behind the attacks on those who helped Bruce Wayne become Batman, I'm not wild about his stable of horror movie henchmen. 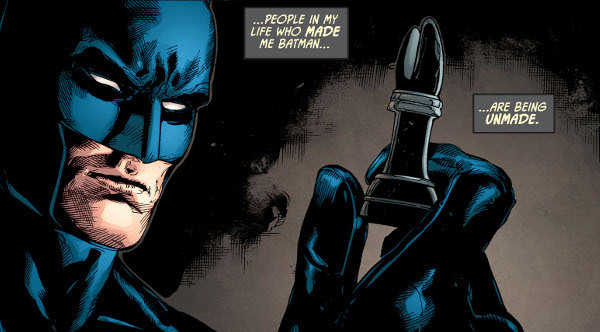 While Batman knows what the attacks have in common there's still the question of why. Why attack those who helped Bruce Wayne years ago? What's the point (other than to create one very pissed-off Batman)? Worth a look.